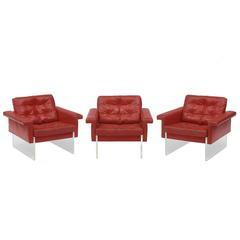 Italian armchairs, Guglielmo Ulrich attributed design, 1960s, Mid-Century Modern. Wood structure with brass-bronze feet, upholstery in luxurious Rubelli blue-grey velvet. Very comfortable. The typical brass feet are specific for ISA Italian manufacturer. Dimensions: Width 70 cm (27.56 in. ), depth 72 cm (28.35 in.) Height 82 cm (32.28 in. ), seat height 41 cm (16.15 in.) Condition: Excellent, newly reupholstered. Armchairs, Italian armchairs, lounge chairs, club chairs, velvet armchairs, Mid-Century Modern armchairs, Modernist armchairs, 1950s armchairs, 1960s armchairs, designer armchairs, pair of armchairs, velvet upholstery, pelouche upholstery, brass feet, brass legs, bronze feet, elegant armchairs, vintage armchairs. Sessel aus der Tschechoslowakei in den 1960ern. 2 Stücke. Maße: H 78 cm × B 58 cm × T 70 cm. Perfekter Zustand 10/10. Ursprüngliche Dämpfung. Hergestellt in der Tschechoslowakei in den 1960ern. 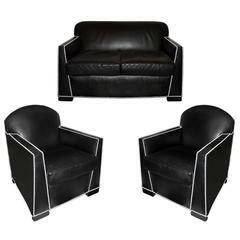 Midcentury Sormani Carlo de Carli pair of armchairs back leather Italian design, 1960s. An armchair, foam padding, fabric upholstery, metal legs. Manufactured in Italy, 1960s. An armchair with foam padding, fabric upholstery, metal legs and brass. Manufactured in Italy, 1960s.